In November, 2013 Transparency International celebrated its 20th Anniversary, that in itself is an important milestone but moreso, in full comprehension of the reputation and credibility which the Organization has earned in such a relatively short time. Transparency International is recognized as THE premier body fighting corruption across the world. The Corruption Perceptions Index is a universally accepted benchmark and its publication in each December is a major event. We of the Trinidad and Tobago Transparency Institute are proud to be the national Chapter of this global movement. There can be little doubt about the achievements of Transparency International in this period. Transparency International was born out of the frustration and disillusionment of Peter Eigen and his colleagues with their experiences in, and dealings with, the World Bank and the funding of projects throughout the developing world, particularly in Africa. They saw, at first hand, the graft and corruption which occurred and which meant that significant funds earmarked for a country’s development projects were channeled into private pockets. At that time – just over twenty years – such graft and corruption – BRIBERY – was considered “a cost of doing business” and in many First World jurisdictions it was deemed a legitimate business expense that attracted tax relief. Thanks to the efforts and promptings of those early pioneers of the Transparency movement we now have, in many of those First World countries, Anti-Bribery legislation which recognizes the paying of bribes (and receiving a bribe) as a criminal offence even if the national of the country commits the act abroad. The trend in the growth of such legislation will continue to encompass a wide range of countries. Trinidad and Tobago ……. It is TIME TO WAKE UP! Permit me to also recognize the contribution of our own national Chapter and our own pioneers like Reggie Dumas and his colleagues who wooed Transparency International to include us under the umbrella. To date we are the only Caribbean Chapter and we look forward to welcoming Jamaica (imminently) and Guyana to the fold and we shall play our part in encouraging others in the region to join. Caribbean ……… it is TIME TO WAKE UP. Over the years we have continued to work to fulfil our mandate and vision for “a country and region that are free of corruption”. We are grateful to all those individuals who have helped to set us on our path – former Directors and members – but I must make special mention of four past Chairman who continue to work with, and mentor, us even now – Reggie Dumas, Frank Clarke, Boyd Reid and Victor Hart. The current Directors are fully cognizant that as we pursue various initiatives – Procurement Legislation; Political Party and Election Campaign Financing – we are really building on work that began over ten years ago. 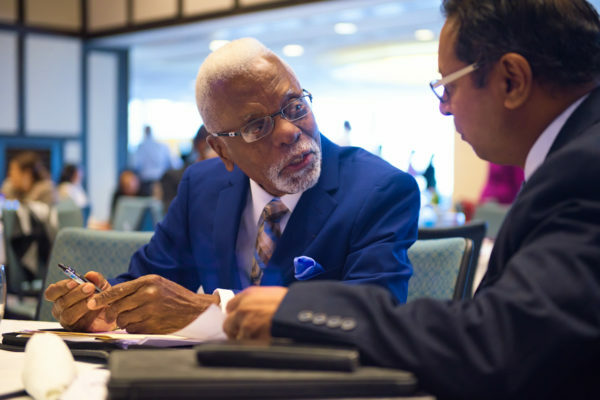 And now, in ADVOCATING CHANGE –WE, Trinidad and Tobago Transparency International, have to be an integral part of that change and to be more forceful, more pro-active, more efficient. We will not compromise our principles or objectivity … we must continue to be non-political and non-partisan but we are exploring ways to achieve goals more quickly. Trinidad and Tobago Transparency Institute … it is TIME TO WAKE UP. Let me illustrate some ways in which we are responding to that call: we have developed a CSO Toolkit, a framework and a manual through which we can assist all Civil Society Organizations to establish a governance structure (by-laws etc.) to enable each one to function in the exemplary manner which we demand of others – in the public and private sector. 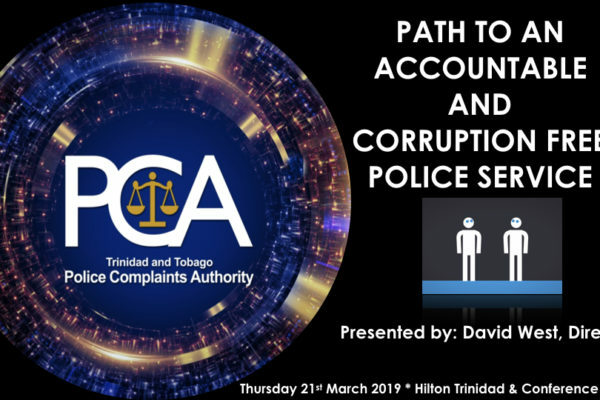 We have shared the Toolkit with a wide cross section of CSO’s throughout Trinidad and Tobago but we have hardly covered the tip of the iceberg. We must pursue that task more vigorously. We have established a “Youth Arm” of Trinidad and Tobago Transparency International with its core at UWI. We welcome them and they are part of our outreach into the Fifth/Sixth Forms of schools and our town hall (community) meetings “Plenty Pepper”. Still, we must do better: we must allow them to lead us in expanding our “public education” programmes including the use of social media and by including all schools and tertiary institutions AND QUICKLY. Later today, Jason Steadman will tell us about plans for our website. And Dion Abdool will also tell us more about our existing project, the Advisory and Legal Aid Centre (ALAC) which we launched in December, 2013. I referred earlier to our pursuit of Party and Campaign Funding and Procurement Legislation both of which we will explore in more detail later this morning but allow me a few moments to indicate our renewed sense of urgency on both of these issues but using the example of new Procurement Legislation: Two years ago we had a draft bill that we thought would be laid in Parliament; a draft which was the result of 10 years of collaboration between ourselves, the JCC, the Chamber of Commerce, the American Chamber, the Local Content Chamber, FITUN, and in discussion with successive Governments and Oppositions. Recently however, a completely new Draft has been presented to us. 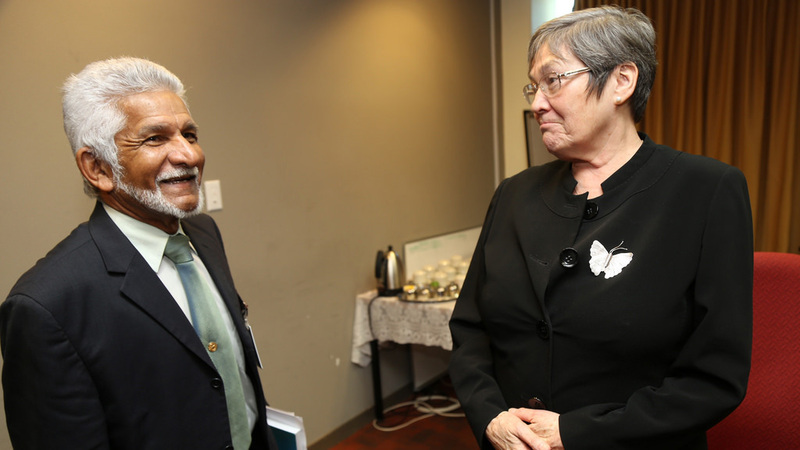 Of course, Trinidad and Tobago Transparency International will collaborate in further discussions – we are not so arrogant to believe that only our draft is acceptable – but we have identified five elements which we consider to be essential to effective legislation and we call on all parties to support those agreed elements to ensure the integrity of a new Bill. Parliament …. IT IS TIME TO WAKE UP. As I touch on some of the priorities we are addressing I am reminded that we conduct these and all of our other projects and programmes with two – yes, TWO – full time staff. To say that we are challenged by the resources which are available to us would be an understatement. I thank our Corporate members and particularly the JBFMT, we could not survive without those sponsors and supporters and our interns and volunteers. We desperately need to build capacity. Therefore I make this special plea to the international donor agencies to reconsider your criteria for funding. By and large, the threshold is considered to be “per capita income”: Lower income countries receive development AID funding – Middle income and higher do not “qualify”. However, I believe that funding for “anti-corruption” work must be considered separately. If we consider that, in general, middle income countries provide attractive investment opportunities it is necessary to ensure that such opportunities are not sullied by corruption risks. It is to the mutual advantage of the potential investor country and the potential recipient country to foster a “clean” environment. 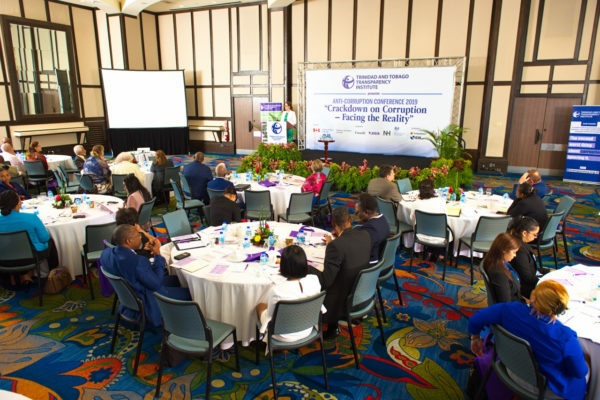 Thus in a country like Trinidad and Tobago, the work of anti-corruption organisations should not be considered in the same vein as “development aid” but rather part of an investment strategy that will make the recipient environment compatible with the emerging regime of Anti- Bribery laws of the donor countries. Donor Agencies … it is TIME TO WAKE UP. Ladies and Gentlemen, we need to change now: starting with ourselves. Trinidad and Tobago Transparency International … let me make it simple and use the CRICKET analogy … We have made a solid start to the innings – it’s a TEST MATCH, we are in for the long haul. We have played ourselves in and we now have to move into a more attacking mode, build the innings, build partnerships with the widest possible range of civil society organizations, the private sector, youth groups, DONORS and FUNDERS, build partnerships with victory in mind. This Test Match against CORRUPTION is a Test Match that we must not lose. Correction, this Test Match against Corruption is a Test Match that we must WIN.